I hardly write things in English, other than work related stuff. 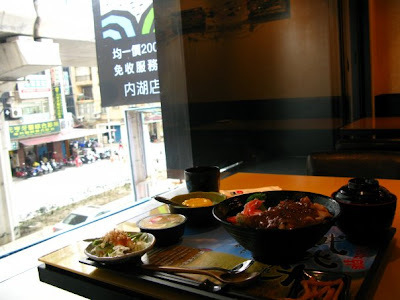 Since my uncle*, Thirsty Pig, invited me to post some restaurants in Taiwan, I tried my best to write something here for the restaurant "定食8 (Teishoku 8)" I have been yesterday and today. You wouldn't believe I had lunch in 2 days at the same restaurant! (hmmm actually different branches) I am fascinated of the cheap Japanese teishoku and the rice. 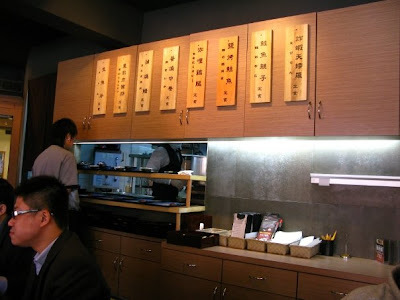 This restaurant is a sub-business of Sushi Express Group (爭鮮). It has 8 different Japanese teishoku, each costs NT$200. Rice, miso soup, sauces and cabbage salad are all free to refill - ALL YOU CAN EAT. Each teishoku (meal set) includes the main dish, rice, tsukemono (漬物: pickled vege), one side dish, desert and miso soup. Yesterday I had Roast Salmon Teishoku for lunch. I didn't really like the salmon. 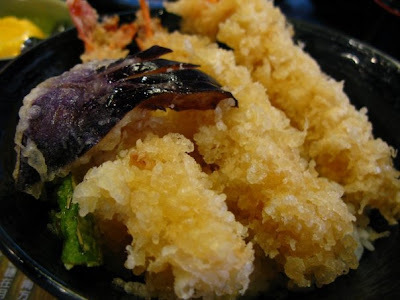 So today I invited some colleagues again, to try Tempura Teishoku. 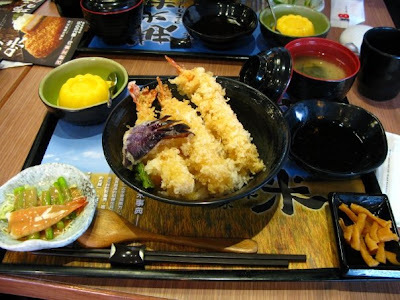 The sauce for tempura shrimp was tasteless but didn't affect the taste of fresh, firm shrimp meat. One of my colleague had salmon oyako don teishoku. 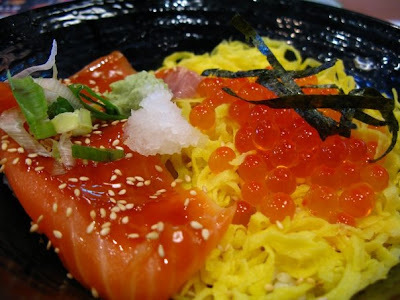 "OYAKO" in Japanese means the parent and the child - represents salmon and the pickled salmon eggs (イクラ). 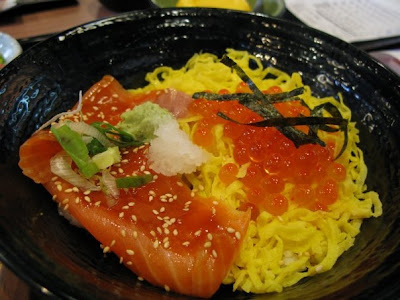 Generally the salmon oyako don has fresh salmon slices (sashimi). But this restaurant offers smoked salmon. I do like smoked salmon but I couldn't really stand smoked salmon in the bowel instead of fresh salmon sashimi! Anyway, my colleague didn't like the taste of pickled salmon eggs. So I ate them all. But the taste of salmon eggs wasn't that good as I expected. The soy sauce taste was too light. Yesterday I was in love with the rice - the strain of Koshihikari (越光米, コシヒカリ) was from Japan and bred in Chiayi, Taiwan. can't resist not to drop by this restaurant and get another set of teishoku! So, here I am. 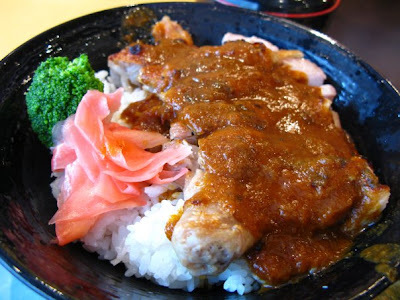 Today I am having Chicken Curry Don, which is one of the recommended meal on the menu. The chicken was soft and BBQ-ed before pouring on the curry sauce. The curry sauce was not good as I expected though. But I had a good time by myself.......after visiting my dentist.